“Happy New Year” wishes normally come for everyone around the beginning of January every year. Only if you are a teacher or a student do you appreciate this wish twice a year – early January and early September, when schools start, at least in Greece! And, if you are a teacher, new years always begin in September and last until the end of August, every time! That is when you make sure you have re-arranged your home desk, bookcase and household to best serve your needs (hoping it will last the whole year through), that is when you try to have finished with any possible bureaucratic or other procedures that can only be performed and completed on weekday mornings and, to make a long story short, if you are a teacher, that is the perfect (and only) time of the year for reflections and resolutions for the (school) year to come! * Spend more time on lesson planning. * Improve my classroom management techniques. * Dedicate more time to each one of my learners (and their parents). * Try new projects, like Teachers4Europe, or Erasmus +. * Encourage and promote collaboration with colleagues of the same school. * Be more organized and prepared in terms of materials. * Improve my computer-assisted language-learning approach. * Try to find/beg for a classroom in school that will be used as an English classroom! * Be more fun, creative and effective during the lesson, when needed. * Spend some more time socializing with colleagues (of the same and other schools). * Tidy my drawer/shelf at school and my handbag more frequently than the previous school years! * Encourage and promote learner autonomy, do not forget! * Create a library with English books and dictionaries for the learners. * Keep my computer files organised, so that I do not have to spend any time during next summer doing that! * Keep blogging, sharing, exchanging ideas and opinions. * Support my beliefs, while being more open-minded. * Be more positive, communicative, cooperative and helpful with everyone at school. * Wear more jewellery, for goodness sake! It does not take up much time to put them on and you have so much of it! * Change my make-up style from time to time, use different eye-shaddows and eyeliner-pencils and eyebrow pencils and lipliner pencils – that is, if they’re still in … But look fresh and renewed! * Try different clothes combinations and wear more of the other clothes in the wardrobe, especially if I lose some weight! * Lose weight! Bring fruit at school! * Dedicate some more time on hair! It really needs it! You also know it makes you feel good! And the list goes on with more personal and/or family or friends related resolutions, but the most appreciated thing around this time of the year is the way you feel about beginnings, the excitement while shopping stationary and other school or lesson related materials and the way that optimism and enthusiasm crawl inside you and take you over! And, although there is always some stress and a feeling that you definitely needed some more rest during summer, you are still full of energy and ready to pursue your resolutions! 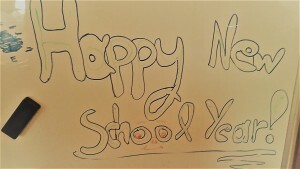 Happy New (School) Year everyone, teachers and learners! Feel free to add and share with us more resolutions in the list and … let’s meet at the end of this school year and see how we did! So, I am off to the hairdresser’s, now, as things on the list definitely deserve respect and some of our time!